“See Naples and die,” or so they say. The same quote is often applied to Barcelona, Catalunya’s eternally popular – and tourist-ridden – capital, but in my experience Madrid beats Barcelona hands down in many respects. Admittedly it cannot compete with Barcelona’s incredible architectural and artistic heritage, but it’s far less crowded, its restaurants feel like real places rather than ersatz tourist haunts, the people are friendlier and the food scene can definitely hold its own. Madrid, as far as I’m concerned, is one of Spain’s great unsung treasures. So it was with great delight that I found myself checking into the Hotel Urban, Madrid’s premier 5-star address. My sojourn to the Spanish capital started on a high note – literally and figuratively – as British Airways are currently using one of their long haul aircraft – 787 – on the Heathrow/Madrid route. Passengers are therefore afforded the luxury of experiencing the Club World Cabin at a very reasonable cost, so fans of veritable bargains may want to book their flights to Madrid soon. But even without such an incentive, there is much to enjoy in Spain’s less celebrated major city. When Felipe II chose Madrid as his capital in 1561, it was a small backwater town of little real significance. Yet today this vibrant and blissfully uncrowded city boasts three internationally famous art galleries, a royal palace, grand public squares and more bars per square metre than any other city in Europe. As a committed bar fly, this was the side of Madrid I was particularly keen to get acquainted with, reliving my student days when I spent a balmy summer exploring the city’s famous nightlife in 2003. But first things first – hotel check in. Arriving early, our rooms were nonetheless ready, so we quickly unpacked and enjoyed a lunchtime libation at the hotel’s signature cocktail bar – Glass Mar. Run by maestro bartender Oscar Duran this striking bar has become THE place to meet before a long night out. Offering a suitably glamorous setting, the designers clearly had a field day at this hotel, installing a crystal chandelier imported from Morocco and transparent “Ghost” chairs designed by Philipe Starck. Complementing the wide range of cocktails is a mouth-watering selection of Japanese-inspired tapas, however, we settled for a glass of sherry before taking the time to explore our immediate surroundings, which are nothing if not eye-catching. Unlike the majority of Madrid’s luxury hotels, the Urban is decidedly modern in both style and approach – a glass-encased tower studded with black stone is a tribute to Art Deco embellishments, with geometric and angular shapes reinforced by a very subdued colour palate. Hell, there’s even a Papua New Guinea museum in the basement, full of figurines depicting deceased chiefs. This is most definitely not an olde-worldly hotel. Which, incidentally, is the best thing about Hotel Urban – luxury accommodation in the most relaxed of settings, without a hint of formality and stiff pretension that so often plagues luxury hotels in France, for example. It offers a relatively modest 96 rooms and suites, all of which boast floor-to-ceiling windows, wenge wood floors and plush marble bathrooms. Hotel amenities are of a similarly high standard excellent: rooftop pool, steam room/hammam, fitness centre and the superlative Cebo restaurant (more on that later). And if that wasn’t enough, the hotel could not be more ideally situated. The hotel is five minutes’ walk from the Puerta del Sol (the heart of Spain’s old quarter) and the city’s leading art museum, the Prado, is 10 minutes’ stroll away. Sipping sherry, I suggested an afternoon dedicated to tapas bar crawling – sometimes hedonism has to trump cultural enrichment. My companion, however, insisted we visit the Prado first. He was right, of course, as art-appreciation is something best attempted sober (or at least reasonably sober). The Prado, incidentally, is named after Madrid’s most exclusive boulevard, the Paseo del Prado which since the 18th century has been a fashionable spot for strolling. It sits at the heart of Bourbon Madrid – the Bourbon Monarchs, especially Carlos III, chose this area to expand and embellish the city with grand squares, fountains and the triumphant Puerta de Alcala. One finds the Prado just south of the Plaza Canovas del Castillo and, unlike the Louvre, is blissfully free of crowds, at least in low season. Yet the Prado more than merits a lengthy queue; it contains the world’s greatest collection of Spanish paintings – especially works by Velazquez and Goya – ranging from the 12th to 19th centuries. It also houses impressive foreign collections, a testament to the historical influence and power of the Spanish crown. Set over three floors, the building was designed in 1785 by Juan de Villanueva, an order of Carlos II, and opened as a museum in 1819. In short, it is an essential stop on any visitor’s itinerary, although there naturally isn’t space here to do the collection justice. As a oenophile, though, I must confess to being drawn to Velazquez’s Triumph of Bacchus (1629) which depicts the god of wine embracing the noble grape with a bunch of acolytes. Nevertheless, after several hours we had exhausted our cultural palate, and sought out more immediate, epicurean pleasures. These can be found all over Madrid, but reach their apogee in the historic quarter. Stretching from the Plaza de la Villa to the hectic Puerta del Sol, the compact heart of old Madrid is full of ‘alegría,’ as the Spanish so aptly put it. Indeed, perhaps Madrid’s most famous attraction is simply the sheer sociability of the Spanish and their infectious joie de vivre. 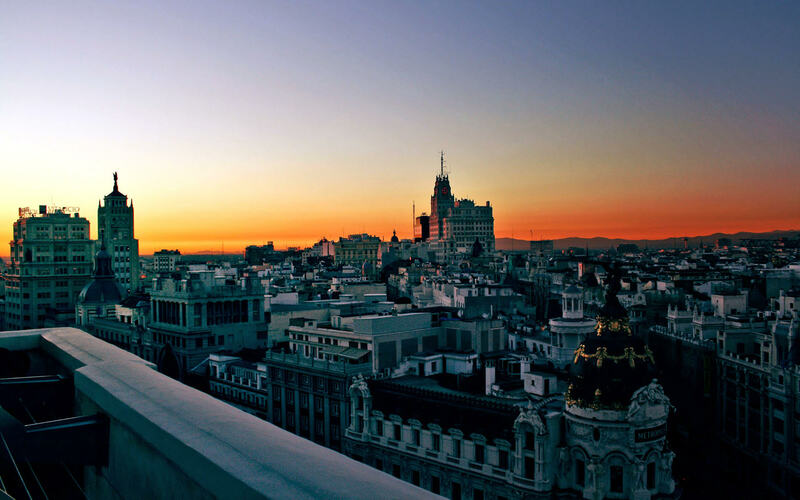 Spain, and in particular Madrid is a city where going to bed early really is a complete waste of your time. Speaking of which, south of the Puerta del Sol is the La Latina district, one of the best spots for tapas bar hopping. The infamous Cava Baja is lined with options, some touristy, some excellent and a few best avoided altogether. Our favourite was Tempranillo, a culinary hotspot that serves – alongside more elaborate dishes – a top-notch selection of pinchos (slices of baguette topped with everything from foie gras with roast apple to cuttlefish with caramelised onions) and a healthy selection of Spanish wines by the glass. We arrived at 9pm and left…. god only knows when. Of course, Madrid offers far more than tapas bars and tortilla. Gastronomes will also find much pleasure at the hotel’s signature Cebo restaurant, where were dined the following day. Overseen by head chef Aurelio Morales, the food is as far removed from staple Madrileño cooking as can be: expect refined, contemporary Spanish cuisine with pan-Asian accents, in a relaxed and yet elegant setting. Generous table spacing is blissfully conducive to a serene atmosphere, while the food is utterly exquisite and beautifully presented. The highlights were numerous, but our favourite dishes included: tripe croquetas (surprisingly moreish), quisquilla shrimp, wild turbot with lágrima peas and nigiri beef aged for 180 days. The wine list complements the proceedings nicely and there is a very friendly and helpful sommelier, who doesn’t patronise, even a little. We went for the extensive set menu, which includes pairing wines. Oh and service was gracious, engaging and courteous throughout. With an early flight to catch, another night out on the tiles was unlikely; we retired to bed and caught our flight back to London the following morning. On arrival at Heathrow, we noticed a gargantuan line of passengers waiting to board the Barcelona flight; visitors who would probably never consider Madrid as a weekend break option. For compared to Barcelona, Madrid’s PR isn’t exactly rock solid, and it lacks the international shine and seaside location of the admittedly beautiful Catalan capital. But, it does have several excellent 5-star hotels to compete with the best in Barcelona, not to mention a surfeit of cultural attractions and arguably Europe’s best nightlife. So the next time you’re planning a trip to Barcelona, take the time to consider Madrid instead.You might find you like it. A standard double room costs from £185 per night, based on two sharing.